Step 1 In a large, well seasoned, cast iron pan melt a tablespoon or so of your fat choice over medium heat. Working in batches, as to not overcrowd the pan, lay the skins into the fat. Let the skins render and cook until a nice, golden brown color has developed. Flip to the other side and fry until golden brown. 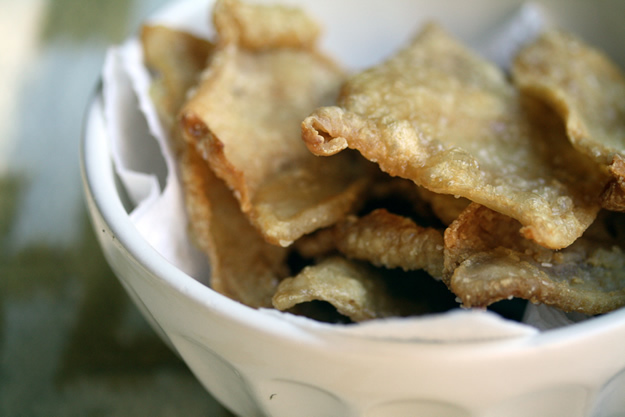 Place the fried skins on a paper towel lined plate and sprinkle with salt. Step 2 If the skins shrivel up & constrict too much when you lay them in the fat: Turn down the heat a bit. Immediately flip the skins over to the other side; this will sort of ‘unfold’ the shriveled side and keep the skins straight. Step 3 Serve immediately, doused with hot sauce and/or drizzled with honey. I really love pork rinds & cracklings, but it’s next to impossible to find any commercial brands that source foraging piggies. Make my own, you say? I’ve tried that, but it just takes so darn long. When those salty snack cravings hit, sometimes you want instant gratification. I got the idea while I was braising some chicken quarters the other night. Braising means you brown a piece of meat in a skillet and then stick the meat in a pot of liquid. In my humble opinion, chicken skin and liquid do not like each other. The skin gets so soggy, and that is something I do not enjoy munching on. So I pulled the skins off the quarters, and continued on my merry braising way, frying up the skins as a late night snack.